When it comes to maintaining and repairing cars, motorbikes and other automotives and machinery, your overhead lights are sometimes just not going to be enough to cut it. What with all the complex mechanisms and small bits and pieces you’re working with, you’re going to need a steady and precise light source to let you do what you need to do efficiently, as well as to make it easy on your eyes. A good penlight is a simple but extremely effective solution. Thanks to the portability, you can have one hooked to or tucked inside a pocket, ready for use whenever you need a little extra light to give your current project a look over – it cuts down the hassle of separately carrying a bulkier flashlight with you all the time, especially in situations where reaching for one isn’t convenient, for instance when you’re working underneath a car or at a height, and need some extra lighting to see what you’re doing. Small enough to clamp in your mouth if you need both hands, and lightweight and grip-friendly enough to use with one hand while you use the other for your project, here are our picks for the best penlight for mechanics. 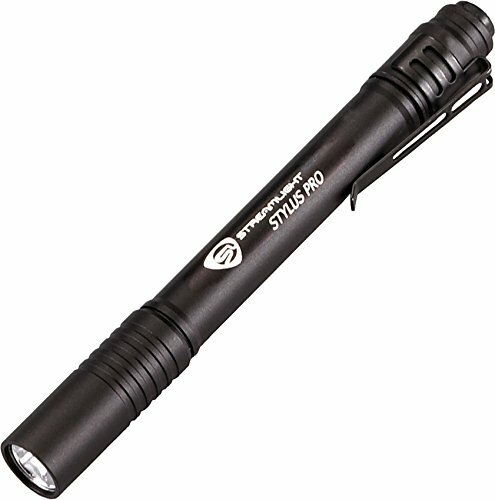 A reliable penlight to depend on, this sleek but heavy-duty unit is just the right size to tuck into your pocket or workbag, the lightweight portability making it the kind of tool you can always ensure you have on you as you work about the garage or for off-site service calls, especially after dark when there may not be a reliable light source around. With a maximum output of 90 lumens, the bright warm white LED light can throw beams up to 58 meters long, perfectly illuminating your workspace so you know exactly what you’re doing. 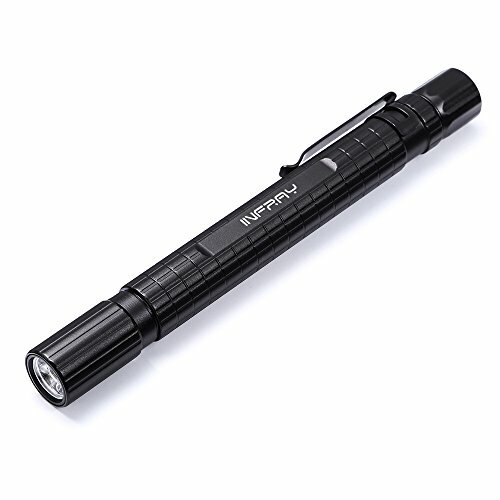 Powered by two Triple A alkaline batteries, the flashlight can run nearly 6.5 hours at a stretch, operable with the click of a button, similar to a pen – the unit features a strobe mode for intermittent periods of light, and a second mode for a constant stream of it. Also similar to a pen, the light comes with a pocket clip to let you carry it securely and ensure it’s always on your person, and immediately accessible when you need it. 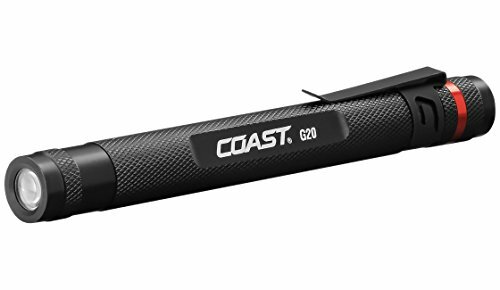 Brilliant for rough outdoor use, the penlight features 1 meter impact resistance, allowing it to withstand bumps, scrapes and falls without getting as easily damaged as many penlights tend to, while also being IPX4 water resistant – this means that although the unit isn’t waterproof, it can still endure getting a little splashed. The anodized aluminum casing, with scratch-proof polycarbonate lens and slip-resistant rubber grip for comfortable use, also make this a durable and long-lasting unit. Built for heavy-duty and outdoor use, one of the highlights of this penlight is its Inspection Beam, throwing a crisp and consistent, circular beam from edge to edge perfectly ideal for throwing a specific area into complete focus for closer inspection, repair and maintenance. The perfect size for carrying in your pocket, toolkit or workbag, the unit comes engineered with impact resistance and IPX4 water resistance, letting it hold up to falls, bumps and the occasional splash of water without failing out on you. The penlight can run for 10 hours at a stretch, and throws a concentrated beam of light as far as 22 meters. The LED bulb ensures greater longevity, brighter and clearer warm white light, and better energy efficiency. An incredibly powerful penlight considering how sleek, lightweight and portable this unit is, you get a maximum output of 220 lumens capable of travelling over a distance of 70 meters, starkly illuminating your work area even in conditions of low visibility. Available in three modes, featuring strobe, low and high modes, the penlight runs on two Triple A batteries, capable of lasting 7 hours on high mode and 14 hours on low. Thanks to the IPX4 water resistance, the penlight is more or less rain proof and great for outdoor use, including in wet conditions, the abrasion and corrosion resistant, premium grade aircraft aluminum casing making it a rugged bit of hardware capable of standing up to otherwise damaging bumps and scrapes. The polycarbonate lens is scratch-resistant as well, an advanced reflector letting you adjust how focused and narrow the beam of light you wish to throw to illuminate specific areas in stark detail needs to be. A sleek and stylish penlight that’d make as much a great gift as a brilliant practical addition to your tool-kit, the marker pen sized penlight features a removable metal clip to secure the unit in place so you have it handy whenever you need it and is available in two colors. With three lighting modes – moonlight, with an output of 1 lumen, middle, with an output of 50 lumens, and high, with an output of 210 lumens – this is a very versatile penlight you’ll find handy in multiple applications, likely to appeal to anyone from nurses needing a very low light to check up on sleeping patients and to check responsiveness of pupils to light, to mechanics needing something brighter to properly make out the components of an engine or machine they’re working on. The LED bulb of the unit has an impressive lifespan of over 20 years, running on two Triple A alkaline batteries. 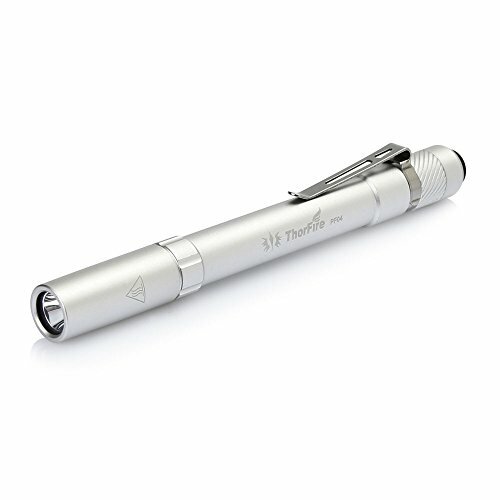 Crafted out of aircraft aluminum alloy, the penlight is lightweight but still sturdy and water resistant.